Easter is right after Spring Break for us this year so if you're one that likes to plan ahead, we've got your Easter events here. We will be updating this list as soon as our usual events post them so check back often. Compiling information is hard work, please link back to this site if using this information on your events calendar. If you want to add your event to this list or work with Corpus Christi Fun for Kids to be a featured event, let us know. Easter photos through Saturday, March 26 during mall hours. Schedule a time online. Pictures with the Easter Bunny every week until Easter. A Spring celebration for the whole family!! There will be snocones, cotton candy, vendors, $15 microchips, adoptions, nail trims, and so much more! Easter Begg Hunt | DOGS UNDER 30 POUNDS @ 1:00 DOGS OVER 30 POUNDS @ 2:00. Fun for the family and pets! Free pictures with Peter Cottontail and arts and crafts for the kids! When Rabbit collects too many carrots it leaves him unable to sleep in his cozy burrow. When his friends offer to help, Rabbit happily accepts. But will too many carrots cause too much trouble for Rabbit and his friends? Join us to find out at a special Storytime featuring Too Many Carrots. This charming picture book shows how friendships get us over the rough spots in life, even if the going gets a little bumpy. Create a special Easter craft for your loved ones. Listen to a heart-warming story with your family too! 1230 Carmel Pkwy. Bring the kids and let them have some fun hunting for eggs and enjoying the booths! Including face painting, fake tattoos, photo booth, relay race, crafts, sack race, and egg toss! Please bring your own basket or bag for the hunt. See you all there! This event is open to the public. Take your basket! Age Groups are listed on the flyer. Proof of age is required. Bring your baby in a cute Easter outfit and enjoy activities, giveaways, photo-op fun & more! Plus, learn creative ways to build baby's first Easter basket. Sponsored by Pampers. Families are invited to participate in exciting Eggsperiments, cool crafts, and fun games as they hop along the Bunny Trail! Visit activity stations set up throughout the museum while earning eggs full of Eggstravagant surprises! Open to all ages. Food and drinks will be available for purchase. Cost: General Admission: Adults $9.00, Senior Citizens $7.00, Children (ages 3-12) $7.00, Children (ages 2 & under) Free, Military (w/ active I.D.) $4.50. FREE for members. Bring your little makers to this family-friendly Easter event to create a one-of-a-kind mixed media art piece. Buy the canvas and the rest of the supplies are free. 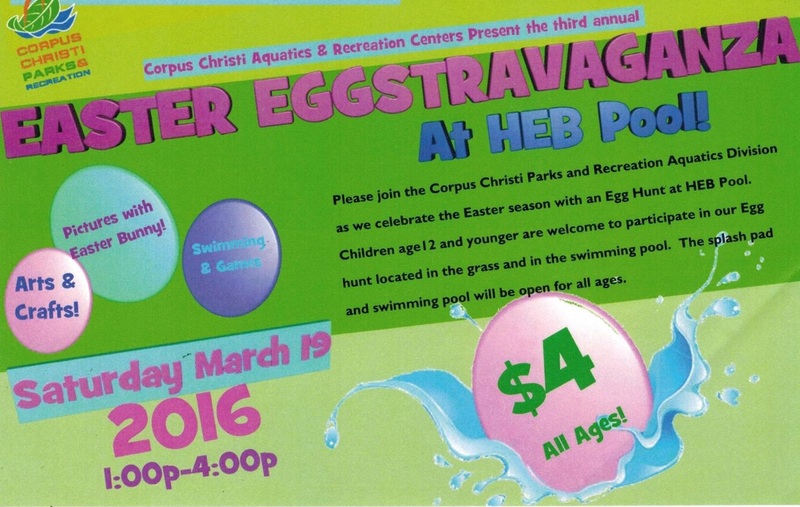 Egg hunt for children 12 and under starts at 1 pm and after there will be Arts and Crafts, Face painting and swimming. 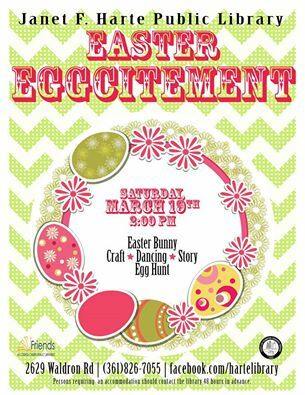 Join us for a story, craft, dancing, an Easter Egg Hunt, and a visit with the Easter Bunny! Join us for a craft, story and an Easter Egg hunt. Don't forget your basket. Egg hunt for ages 0-12. Food, crafts, prizes. All children 5th grade and younger welcome. Don't forget your Easter Basket! Bring your basket and join the fun! 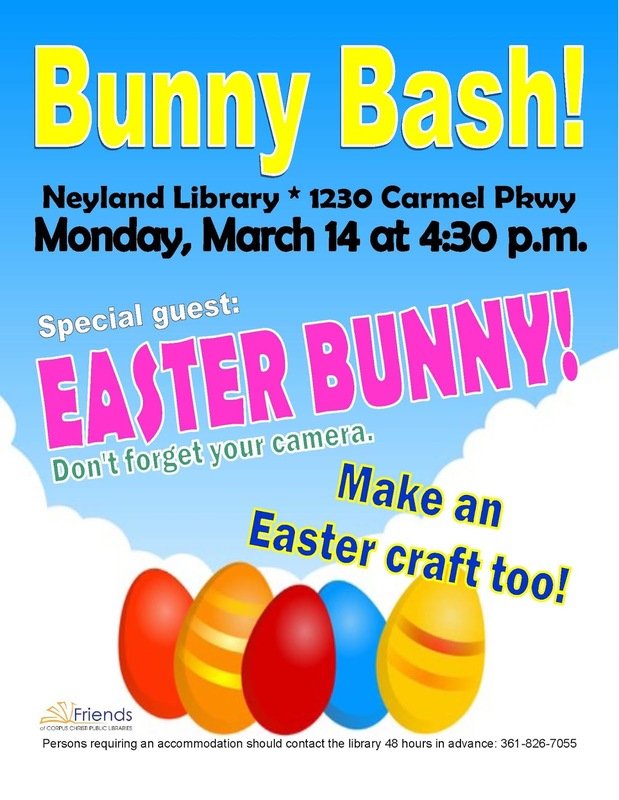 Meet in the children's area of the library after Mr. Kippy's 9 a.m. storytime to line up for the egg hunt. Don't be late! Mr. Kippy will have a second storytime after the Easter Egg hunt too! This is event is open and free to all kids and made possible with funding from The Friends of the Library and H-E-B! Eggstra! Eggstra! Read all about it! Your favorite neighborhood grocery store is hosting the healthiest Easter egg hunt around! Hop on over to one of our eggclusive good4U events, at either 11a or 4p, and eggsperience the fun! Featuring kid-friendly activities & prizes. Get those Easter baskets ready! All ages welcome. 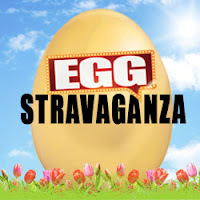 Free egg hunt with over 20,000 eggs + 10 Golden Eggs! This event is for children under 10-newborn! Fun event for those with NAS CC access. Events include: Inflatables, Balloon Sculptures, Face Painting, Egg Coloring, Caricature Artist, Egg Hunt, Golden Egg & Prizes, and Pictures with the Bunny. Free food and drinks will be served. Don't forget your basket or bag for the Egg Hunt! Thank you to CMWR for being an in part sponsor for this event. Please bring your own basket or bag! Make sure to RSVP so they can plan for quantities. This will take place at the park across the street from the Youth Activities Center. Egg Hunts by Age Group, games, petting zoo, face painting, fire truck, silent auction, inflatables, sno cones, popcorn, hot dogs, SWAT truck, and hay ride. Easter experience, drinks, Coastal Bend Blood Center, swing ride, and more.Everything is free! Fun for children 12 and under, while supplies last. Hot dogs, face painting, Easter Bunny photos and more. 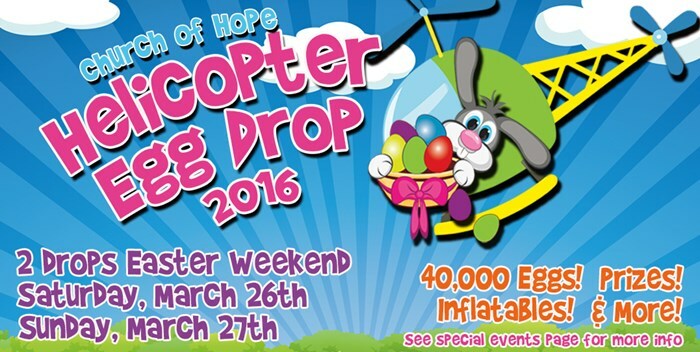 40,000 eggs, prizes, inflatables and more! 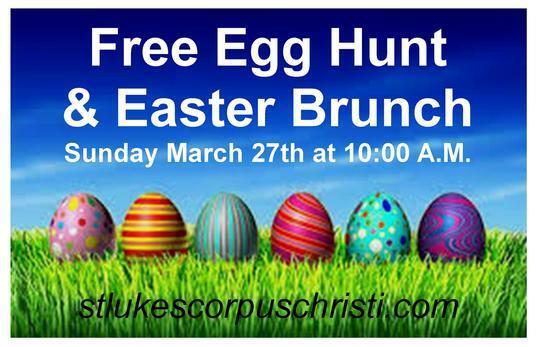 Rockport's largest FREE Easter Egg Hunt. Candy and prize-filled eggs will be scattered across the grounds. Please arrive AT LEAST 15 minutes early to park and line up. They will have a designated area for small children to hunt. Egg hunt along with music and food stands. Prizes to be raffled away.